The Crystal Palace restaurant is one of the best Disney World character dining locations for all ages. Located at the end of Main Street in Disney’s Magic Kingdom you can eat breakfast, lunch or dinner with your favorite characters. The food is of a high standard for an all you care to eat buffet, the atmosphere is lively (and rather noisy). 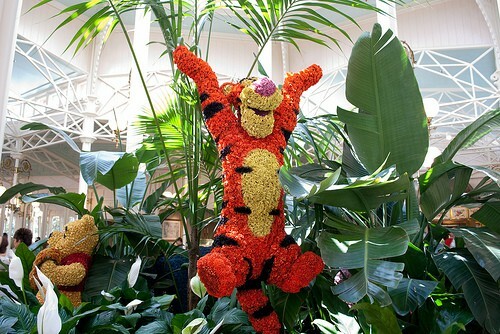 The kids are going to love the chance to dine with Winnie the Pooh and his friends. 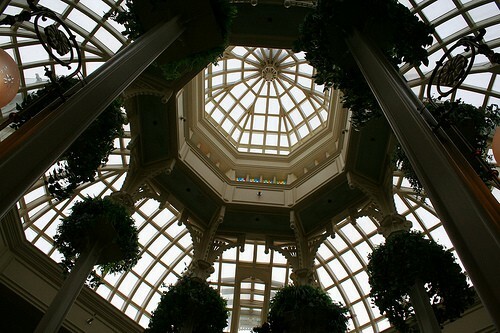 The Crystal Palace is one of my favorite places to eat in Magic Kingdom. Finding a great restaurant in the Happiest Place on Earth can be a bit of a challenge but this restaurant definitely pleases all members of my family. Both the outside and the inside of the restaurant are visually stunning. The building looks like a huge Victorian Conservatory. As with all Disney dining you should make Advance Dining Reservations if you can but it is worth asking if they have any walk ins available. Once your turn arrives you will be shown to the register where you pay upon entering the restaurant. This is unusual for a Disney restaurant but it works well. You will then be shown to your table in the light and airy dining room. The tables are rather close together, and when it is busy, the noise level is high. But the area around the buffet is well designed so there is rarely too much of a line. Characters in attendance are Winnie the Pooh, Tigger, Eeyore and Piglet. This means that the Crystal Palace mainly attracts families with young children. The characters spend a good amount of time with each guest. 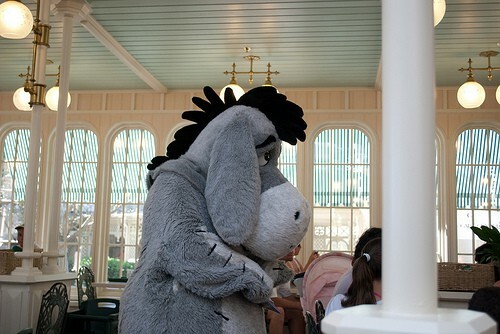 Remember that as will all character dining, if you are mistakenly missed by one of the characters then tell a Cast Member and they will always do their best to get your favorite to pay you a visit. Every day is Friendship Day in the Crystal Palace. Once or twice an hour the characters will dance around the restaurant and invite anyone who wants to join their parade. This is a lot of fun for the younger ones! Breakfast at the Crystal Palace is one of the most popular meals. Being located in the Magic Kingdom this is an excellent chance to arrive early in the park and enjoy some of the rides before the crowds arrive, and then refuel with a character breakfast. Breakfast is served from 8 am to 10.30 am. The cost is $26.99 for adults and $14.99 for children aged 3 to 9. Children aged under 3 are free. Breakfast has all the usual favorites. The menu does change but will usually include: scrambled eggs, bacon, sausage, hash browns, oatmeal, assorted cereals, pastries and fruit. The selection is very good and coffee and beverages are included. The Crystal Palace is a great place for lunch. Touring the Magic Kingdom can get very tiring, particularly if you are visiting with young children, so it is often a great idea to have a rest in the middle of the day. This is particularly true in the summer months when the sun can be extremely strong and you really do need to take a break in the middle of the day. The Crystal Palace lunch is priced at $28.99 for adults and $15.99 for children. Again the menu does vary but can include: Mixed Field Greens with a choice of dressings, Shrimp Black Bean and Mango Salad, Mediterranean pasta Salad, Tropical Slaw, Tabbouleh Salad, Edamame Salad, Sliced Turkey, Stir Fried Curry Noodles, Fruit and Vegetable Tofu Curry, Atlantic Salmon, Rotisserie Chicken, Pork Tenderloin, Vegetable Pasta, Cheese Pizza, Wild Mushroom and Chicken Pasta, Medley of Vegetables, Garlic Mashed Potatoes. There is a separate children’s buffet which includes the usual favorites of Mac and Cheese, and Chicken Fingers. If you have a sweet tooth you are certain to enjoy it here with such offerings as: Boston Cream Pie, Chocolate Chip Cookies, Double Chocolate Brownies, Mango Flan, Apple Cobbler and Banana Bread Pudding with Baileys Irish Creme. Dinner is priced at $40.99 for adults and $19.99 for children aged 3 to 9. Peel and Eat Shrimp, Fire Roasted Prime Rib, Herb Roasted Turkey, Thai Curry Mussels, Key Lime Pie, Tiramisu and Red Velvet Cheesecake. Have you dined in the Crystal Palace Restaurant? What did you think of it? Let me know by leaving a Comment.